I haven’t been reading much of the news from the bombing; it was making me far too sad. My heart is aching for everyone in Boston, and for our country. I mean, yeah. It’s just heartbreaking. But sometimes the best way to combat the evil and to show our enemies that our spirit will not be crushed is to go on with the mundanities of life. We can infuse the routine of our life with purpose and holiness, and that is a victory. This is a post I started last week. I’ve been so busy (In Harmony concert in May! May 26th! Cleveland!) that I haven’t had a minute to finish it. But I’m making a minute tonight. Because this is my little act of defiance in the face of terrorism. I won’t let it make me so sad that I can’t do anything. May we all have the strength and willpower to make our lives beautiful and full, despite attempts to make the world unbearable. And may everyone touched by yesterday’s tragedy be comforted. Clutter. It’s a sneaky thing. No matter how small my living space or how vigilantly I try to keep on top of it, it creeps it and settles down until every available surface is covered with stuff. And really, it’s just “stuff” that’s covering my nice, clean surfaces. Stuff that needs to be put in its proper place. Stuff that needs to be thrown out but for whatever reason (I might use it later! ), has be spared the trash bin for one day more. Stuff that doesn’t have a place. Stuff that has a place but said place has been covered by other stuff. When my apartment gets too cluttered I really don’t function as well. Things take too long to be found, or cannot be found at all. As the clutter builds, I feel progessively more overwhelmed and despair of ever getting things in order. This leads to more procrastination, which makes me cranky. And that’s no good for anyone. I read an article in the March 6th issue of Mishpacha Magazine’s Family First which blew my mind, for a couple of reasons. Reason number one was that the article was written about someone I know in real life. Simi Friedman is one of the nicest people you could ever meet, and I was so happy to read about her! The article was about her very creative approach to maximizing the space in her home. I was very inspired by her ideas, like using the linen closet for a bookshelf, for instance. And keeping her kids’ clothes in the basement near the laundry station which streamlined laundry. Her kitchen was also a breath of fresh air. No junk drawer in there! I was so inspired that as soon as I could (meaning, after Shabbos), I started reorganizing. With three little kids and about a million side projects, I don’t have much free time, and the free time I have I don’t really use for home organization. But that’s on me, becuase I LOVE home organization. And kudos to Simi for rekindling this drive. New Series! Clear Surfaces, Clear Mind. home improvement, here I come! Because of this inspiration, I decided to start a new series on the blog, about reclaiming the clear space in my house, and creating a clearer space in my mind as a result. Each post, about one a month, will feature a different area of my apartment that has been overrun with clutter. And I’ll tackle it, and tell you about it. I’m starting in the kitchen. My kitchen is bigger than my last one, but that’s not saying much. And I do not really use the space very judiciously. So, my “old” kitchen setup featured a pantry where I never knew what was in the back. Following Simi’s example, I took out the food and put in my dishes. It actually freed up a lot of space, and looks a lot cleaner, too. 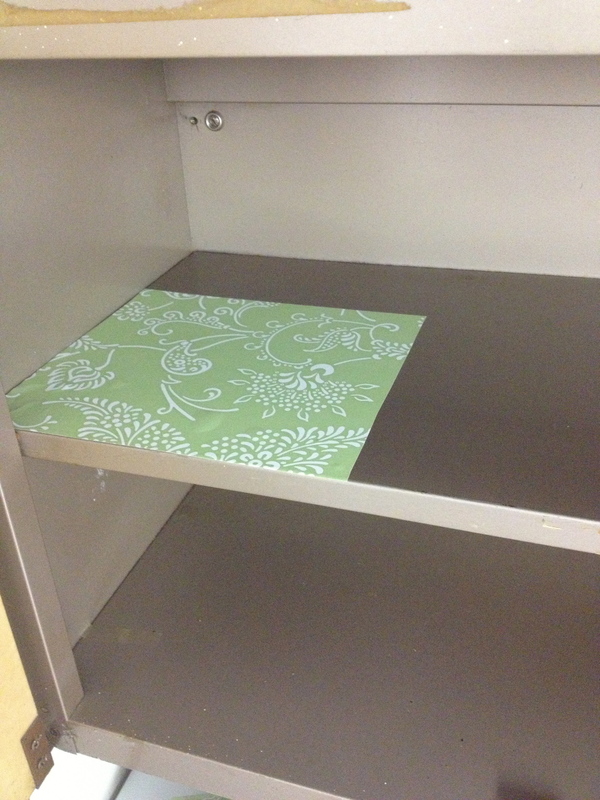 I also laid some contact paper down in my cabinets. These cabinets looks like they are pre-cold war. They are metal and rusty and gross. 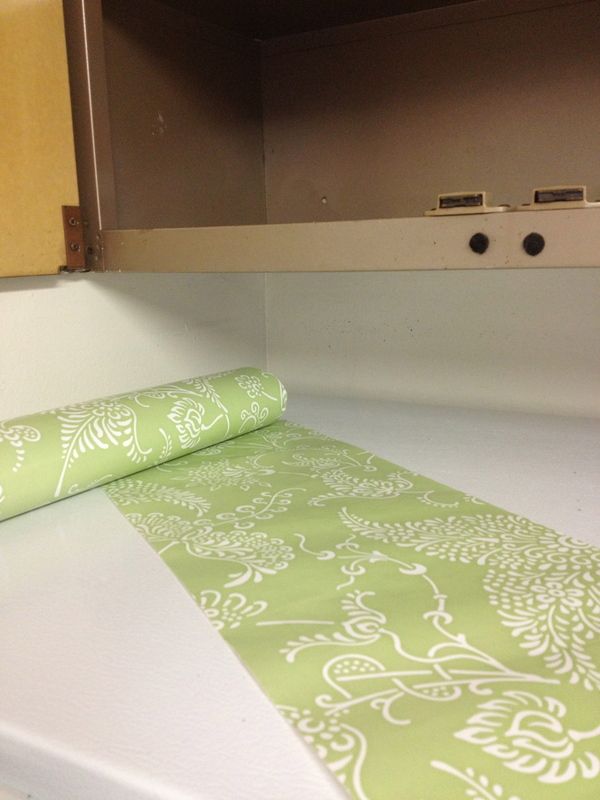 I had wanted to lay contact paper down for a long time, but just never got around to it (know that feeling?). Well, I finally got around to it. But the best part is that I did something with the cabinets above the fridge. 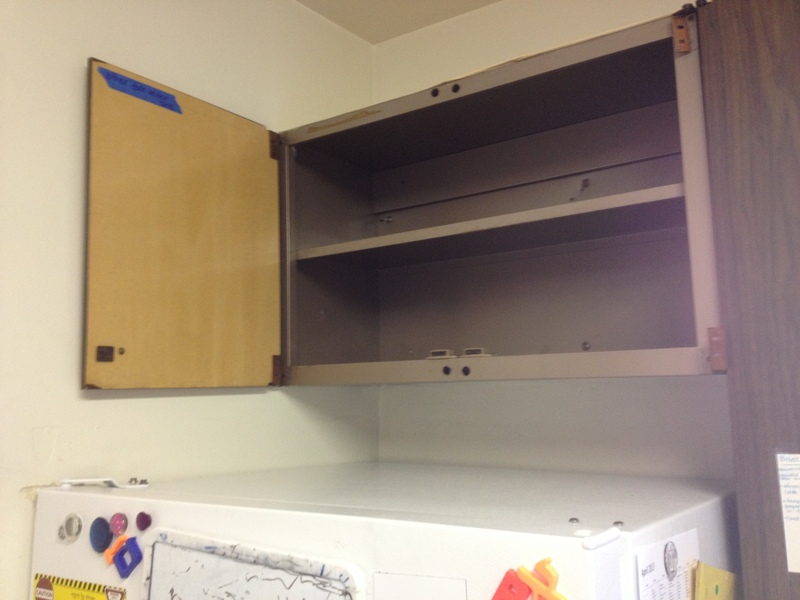 In every home I’ve lived in, there are small cabinet doors above the fridge and I never use them for anything useful. Things always pile up on top of the fridge, and then I can’t get into the cabinets, and then I forget what’s in there. I always viewed them as useless, really. See? Can’t get in there. But after reading this article, I had a flash of inspiration. What if I removed the doors from the cabinets? Then I could use the space on top of the fridge AND the space in the cabinets. And I wouldn’t forget what was in there because I could see inside!!! I took the door on the right right off. So I don’t forget where I put the now-removed door, I used a piece of painter’s tape and a sharpie to make a note on the remaining door. See it up there in the top left corner? 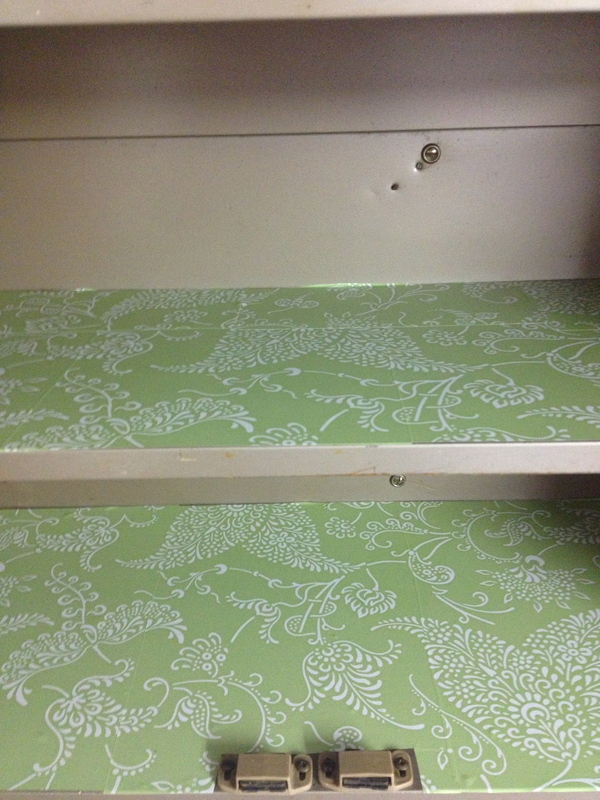 Next, I took some of my pretty contact paper that I kept around from last Pesach (not the most recent one, but the one before that). This was an instance where me keeping something because I “might use it” actually worked out. Ha! I’ve found that applying the contact paper in small sections is a more effective way of laying it down. After I “discovered” this method, I realized that there are instructions on the back of the contact paper that, had I read them earlier, would have informed me of that trick. Then I took some time to think about what I would actually want to store up that high. It would be things I used somewhat frequently, but not too frequently. I didn’t want to be in a rush to fill it up, so I was okay with leaving some empty space. I also added a little artwork, courtesy of Little Man, to liven up that cabinet door. I’m so happy about those cabinets I get a little pep in my step every time I look at them. Thank you, Simi! What area in your home is the biggest clutter magnet? 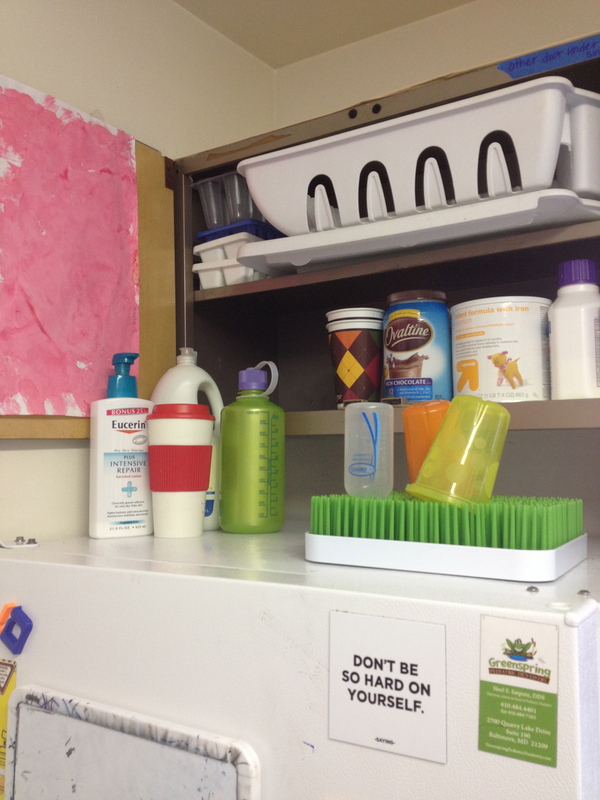 Is there an area you tackled during spring cleaning that you’re especially happy with? I just went to a fabulous Laughter Therapy sesion on SUnday with Esther Rachel Russell, and then yesterday — I felt all drained again. Thank you for that first paragraph — for reminding us we aren’t terrible people for remaining joyous. Although my post today was written during the throes of sadness, it isn’t actually sad. I don’t think. I love your new decluttering series. You are like a little ant — always doing, even when others seek to knock us down. Hi! I loved this. Good for you! That contact paper is gorgeous, and I really appreciate what you said at the beginning about moving on with the mundane in the face of tragedy. Thanks! Sometimes it only takes something as seemingly insignificant as pretty contact paper to make things seem better, you know? Good job! You’re correct, we need to keep on keeping on. It’s what makes us winners in the face of adversity. Thanks! Exactly. Adversity can be a demanding teacher, but a teacher nonetheless. Our friend Amy told me a few years ago that it was important to see everything in my cabinets or else it would get “lost” like you mentioned. When i visited my ultra-organized cousin in Jerusalem, I noticed that her cabinets were packed with lazy suzans. Since then, I splurged on a bunch and have more organization than ever before and nothing remains in the back! Now, my problem is to deal with the overflow of food and storage (no, i am not hoarding, thank G-d) and to meal plan all of that food into another organized routine. G-d help. Sending you hugs! Oooo – lazy susans! That’s exciting! I’m working on building dinner from ingredients I have on hand. Like that can of coconut milk I’ve been neglecting in the pantry… hugs back! I like the new look. Totally know what you mean about cabinets above the fridge being useless. I can’t even reach mine over our very tall fridge. It really seems to require constant vigilance to stay on top of things. Entropy moves extremely quickly in my home, too! You’ve inspired me, once again. Happens to be the cabinets above my fridge are really high and ridiculously deep. 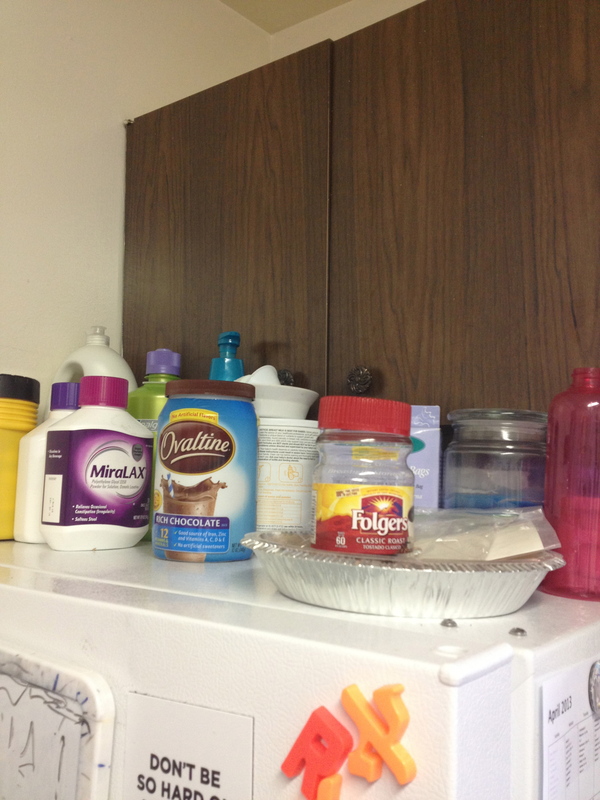 I use one side to store the appliances I almost never use (why do I own an ice cream maker? 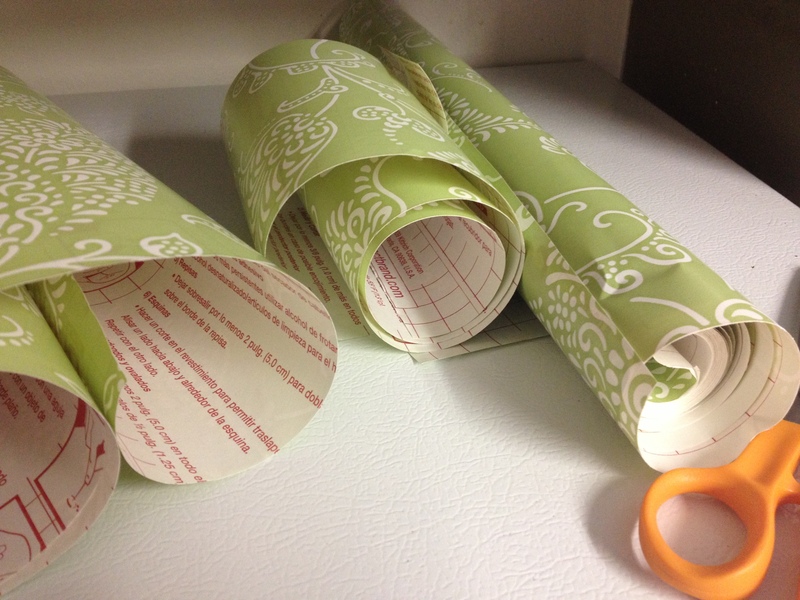 ), the other to store the really long boxes of foil, parchment paper, freezer paper, etc. Thanks for this! Hopefully it’ll motivate me to tackle one of the many many many areas in my home. One small area at a time, eh? Yay! I’m so glad! An ice cream maker would be fun, but I would also have it up there above my fridge. :) And yes, one small area at a time. Exactly! In all honesty – school shootings, as well as what happened in Boston – would never have happened here. Because we are aware, and we detonate all unaccompanied bags. I feel really cruel saying this, but it’s about time America learned to copy Israel’s security strategies. Then, maybe these things wouldn’t happen. I hear what you’re saying, and I don’t think it’s a cruel thing to suggest. My husband and I had a conversation about how the US could benefit from consulting Israeli security people. But don’t forget that security measures like detonating unaccompanied bags exist because “these things” used to happen in Israel. A lot. Between 2001 and 2004 there were 127 bombings. On buses, train stations, clubs, restaurants, crowded streets. And don’t forget that there are still bombs coming in from Gaza. Also, the US is such a huge country, I’m not sure how feasible it would be to enact a similar security model (checking bags at stores, before entering malls or other crowded areas). It wouldn’t happen quickly, in any case, and I can’t picture the majority of Americans being comfortable with rifle-weilding soldiers at every entrance. At the end of the day, no matter how good the security is, it’s still up to Hashem. And it’s still up to us to do a cheshbon hanefesh when there is a tragedy, to see where we can improve our avodas Hashem, to try and improve the world in the way we can. Yes – but these things are happening in America, too. We’re just at the beginning of it, instead of in the middle. I don’t think it has to do with the size of the country – crowds happen no matter where. It has to do with mindset, and you’re right that Americans wouldn’t be comfortable with it. On the other hand – are Americans comfortable sending their kids to school still? Yes, at the end of the day it’s up to Hashem. But I think that He wants us to do histadlus – and part of that is security measures. So pretty! I recently moved to a much smaller home and am having a hard time figuring out where to put everything. I will follow your series!